Collingwood defender Ben Sinclair is scheduled to meet a specialist to deal with the next phase in his return from a hamstring injury. Ben Sinclair’s luckless run with injuries continues, with the hard running and creative small defender to undergo surgery on his left hamstring. Defender Ben Sinclair will miss Monday's ANZAC Day blockbuster with concussion. Constantly belies his build to be an inspiration to teammates with his attack on the ball and the ball carrier. Possesses genuine pace, desperation and a willingness to compete. These qualities have made him a valuable option at both ends of the ground during the first six years of his career. He made his name as a small forward in 2012 but found himself playing in a lock-down role at the other end of the ground the following year. A brave and diligent customer, Sinclair will be hoping for an injury-free run in 2017 after several years blighted by hamstring strains and concussion. A year of highs and lows for one of Collingwood’s most underrated players. 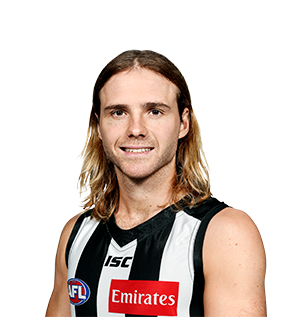 Free of the hamstring injuries that blighted his previous two years, Sinclair managed 13 games in the back pocket and established himself as a member of Nathan Buckley’s first choice line up. But as has often been the case during his career, injuries punctured his campaign. Four separate bouts of concussion forced him into the grandstands, the last of which ended his season in round 18. Unfortunately for the injury-prone Sinclair, 2015 took him down a path he is all too familiar with. Similar to the year prior, he started the season in the senior side and had an extended break on the sidelines throughout the middle of the year before managing another handful of games at the end of Collingwood’s campaign. 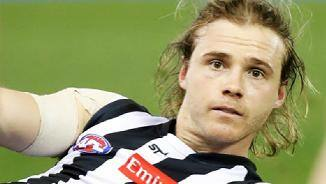 The 23-year-old defender suffered a reassurance of previous hamstring injuries when he pulled up lame in the first quarter of Collingwood’s round three loss to Adelaide. He was given the red substitutes vest and disappeared from senior action until August. Given his history of soft tissue injuries, the approach taken with Sinclair was a cautious one. Prior to returning to the AFL fold he played five games in the VFL where he averaged 15 disposals and 4.4 marks per game. The gentle transition was a successful one. Upon return to the MCG under Nathan Buckley, the former Scotch College junior increased his disposal output to 17.5 per game. After playing just 11 AFL games in the past two years, Sinclair will hope to return to full fitness in 2016. Having created a niche for himself in the back pocket during the latter stages of 2013, Sinclair entered his fifth season on the list keen to make the position his own. He began on the right note, too, winning 20 disposals in the heavy loss to the Dockers in round one. It was just weeks after he had finally graduated from the rehab group after shoulder surgery cut his 2013 campaign short after 21 rounds. Sinclair originally returned in a VFL practice match against Port Melbourne and returned to the senior side in its come-from-behind win over Gold Coast a week out from round one. Unfortunately the 22-year-old was back in the rehab group a short time later when he injured his hamstring in the gutsy win over Sydney in round two. He returned in the VFL several weeks later but broke down again in his second game back, this time damaging his ‘good’ hamstring as he ran through the midfield to deliver a pass to Patrick Karnezis during the win over Geelong at Victoria Park. Another eight weeks elapsed until he finally returned – this time for good – against Frankston on 27 July. Solid performances across the three weeks that followed ensured he was back in contention for a belated return against Brisbane in round 21. He got through the remainder of the season unscathed, playing an important role in the win over Greater Western Sydney in round 22. It was season of transformation for the gutsy 22-year-old. Few would have guessed that he would have ended the season entrenched in the back pocket after bobbing up for 14 goals as a small forward in 2012. He started the year at the feet of Travis Cloke and Quinten Lynch but struggled to impact the scoreboard, his two goals against Carlton in round two aside. His fanatical attack on the opposition backmen waned after a strong start (Sinclair laid 13 tackles in the first two games) and he returned to the VFL for the first time in more than a year after being substituted out of the ANZAC Day loss with only five touches to his name. In hindsight, ANZAC Day represented a sliding doors moment for Sinclair who was demoted to the VFL but did so with a new role to play, as he was nominated as a candidate to replace Alan Toovey who happened to sustain a season-ending knee injury against the Bombers. Sinclair’s back pocket adventure began slowly but gathered pace with 19 and 21 disposals in successive weeks against Geelong and Essendon. Importantly, he was able to quickly find the balance between attack and defence and his refusal to concede an inch saw him catapulted back into the seniors for the Queen’s Birthday clash with Melbourne. He received an AFL Rising Star nomination in the corresponding game last season and it again served as a good luck charm for Collingwood’s No. 28. It marked the start of an unbroken 10-game run that saw Sinclair carve a niche in the back pocket alongside fellow little man Marley Williams. His ability to create and provide rebound improved with each passing week and by round 19 was gathering a career-high 20 possessions, three rebounds and four inside 50s against Essendon. Unfortunately a shoulder injury against the Hawks a fortnight later put the kibosh on his season but he should finish it proud of what he was able to achieve. The small forward made considerable inroads in his third AFL season, playing 20 games and earning a Rising Star nomination for his three goals against Melbourne on the Queen’s Birthday. Had injuries in the second half of the season but performed well against Hawthorn in the Qualifying Final when he tagged Grant Birchall. Will develop further with another full pre-season. Received an early opportunity in the NAB Cup series. Started the year in the VFL but missed 12 weeks with a leg fracture. Impressed greatly upon return with his pace and tackling, which earned him a debut in round 19 against the Bombers. Started as the substitute and had eight possessions and a goal by the end of his one quarter on the field. Returned for the last three rounds of the home and away season where his hunger for the contest in attack meant he was on the fringe of selection right throughout the finals campaign. Was an emergency for the Grand Final. Surprised with some strong showings in practice matches against Adelaide and Richmond despite his slender frame. Played 14 games in the VFL, mainly on the wing and at half forward, where he was named in the best once. Missed three weeks early in the season with a shin complaint. Played for the Oakleigh Chargers in the TAC Cup U18. Represented Vic Metro at the U18 National Championships, where he averaged 12.8 disposals and 3.0 tackles. Suffered glandular fever late in the season.